Communication Intelligence capacity is a required leadership and management competence that influences employee interaction, engagement, and relatedness. And, it falls short. A clear indication of misalignment of communication style and behavior comes from a Forrester study revealing that 88% of sales professionals calling on business buyers are knowledgeable about their products and services, but only 24% understand the client’s business issues (Santucci, Holmes & Feldman, 2012). Only 12% of business leaders claim that sales professionals contribute any insight in their conversations. Poor communication is cited as the main cause of failure of IT projects by 28% of respondents in a CTIA survey (Rosencrance, 2007). 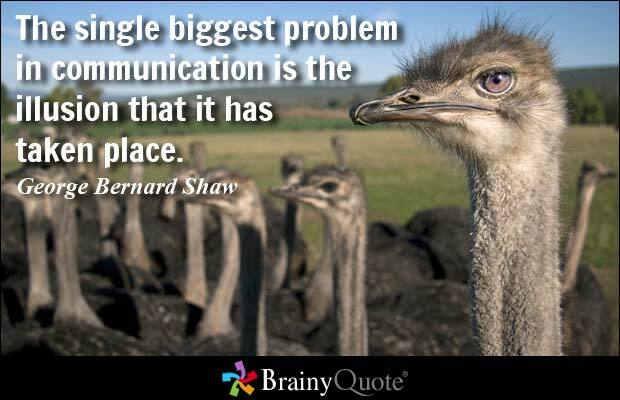 The question remains: how can so much communication yield so little understanding? Especially when there is so much at stake in this perpetually changing world we compete in? Communication Intelligence plays an integral role in communication style and behavior development. An increase in communication intelligence capacity in leadership and management filters into the organization and fosters a culture of trust, so that staff feel empowered, certain, and related. They then contribute whole heartedly to performance at a higher return-on-effort. If you believe that communication is a vital influencing factor in the performance of your organization, what are you doing about it? A Communication Intelligence profile establishes your communication style and behavior preferences. This is a great departure point for improved resonance within your team and more connectedness with your clients. Rosencrance, L. 2007. Survey: Poor communication causes most IT project failures. [Online], Available: http://www.computerworld.com/article/2543770/itmanagement/ survey–poor-communication-causes-most-it-projectfailures. html [2017, April 20]. Santucci, S., Holmes, B. & Feldman, D. 2012. Executive Buyer Insight Study: Are Salespeople Prepared For Executive Conversations? [Online], Available: https://www.forrester.com/report/Executive+Buyer+Insight+Study+Ar e+Salespeople+Prepared+For+Executive+Conversations/-/ERES56792 [2016, December 19]. Sull, D., Homkes, R. & Sull, S. 2015. Why Strategy Execution Unravels—and What to Do About It. [Online], Available: https://hbr.org/2015/03/why-strategy-execution-unravelsand-whatto- do-about-it [2017, April 20].